I can not resist a nice big juicy grilled burger. However, there are some people that can. If you are one of those people, this recipe if for you. I’m just kidding! while I do love my regular burgers, this is a nice alternative. It has a little heat from the chipotle, coolness from the slaw, and a little sweet from the grilled pineapple salsa. In a food processor combine, the shrimp, egg, panko, garlic, salt, pepper, cumin, chipotle pepper, and lime juice. Pulse until mixture is a coarse puree. If mixture is too wet to form patties, add additional panko 1 tablespoon at a time until mixture can easily be formed into patties. Divide mixture into six patties and place in the refrigerator for 30 minutes to set. Place pineapple on grill and cook until golden brown, about 2-4 minutes per side. Chop pineapple and add to a medium bowl with remaining ingredients. Once burgers are set, brush each side with olive oil. Grill burgers approximately 5-8 minutes per side until completely opaque. Brush rolls with softened butter and grill 1-2 minutes until lightly toasted. 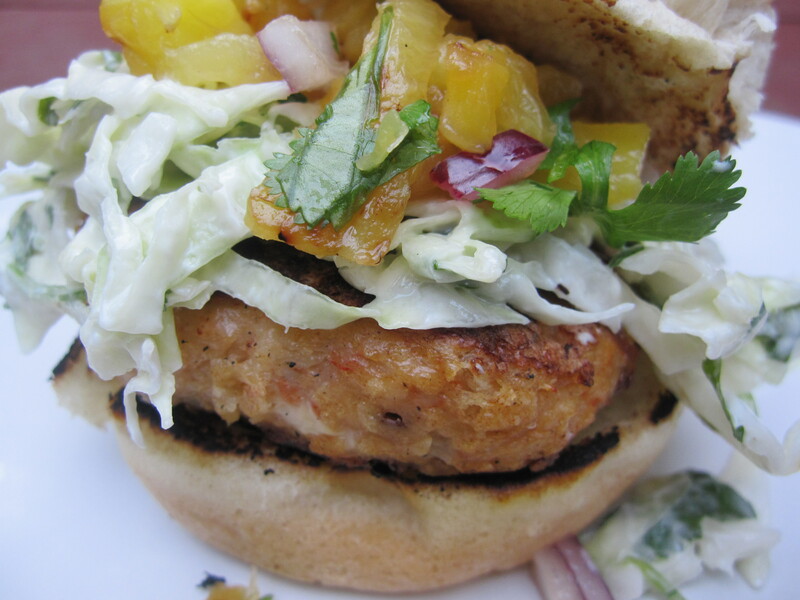 To assemble burgers, place shrimp burger on toasted roll and top with cilantro slaw and grilled pineapple salsa. mmmmm, yum!!! do you think this recipe is also doable with fish? I think fish would be great! I was thinking of trying it with Mahi Mahi.